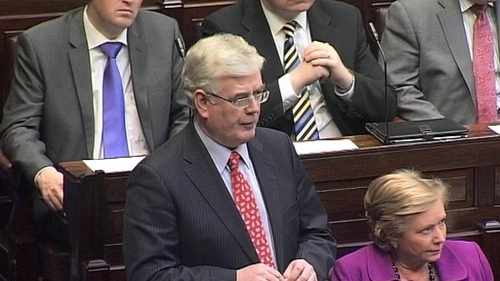 Tánaiste Eamon Gilmore has said that the referendum on the rights of the child will be held in the autumn. Mr Gilmore has told the Dáil that the issue needed to be progressed on a non-partisan basis. He said there is a necessity for early intervention in many cases, as highlighted in the child protection services report, and this must not be politicised. Earlier, Minister for Children Frances Fitzgerald said that the report on the deaths of children in State care makes for poignant and distressing reading. She had appeared before the Health and Children Committee to discuss the findings of the report. Ms Fitzgerald said it was particularly upsetting to think that the child protection services outlined in the report were working during the height of the Celtic Tiger boom. She said that child protection was not a priority then and that huge lessons had to be learned from the report. The report showed that young adults up to the age of 23 are very vulnerable. Ms Fitzgerald said that a particular focus had to be put on the 16-18-year-old group. She said that connections between mental health services and child protection services need to be worked on. Elsewhere, organisations, including Barnardos and UNICEF Ireland, have welcomed the announcement that the referendum will be held in the autumn. Barnardos said that the announcement was timely in light of yesterday's report on the deaths of children involved in the care system. UNICEF said it would support any proposed Constitutional Amendment that is consistent with the United Nations Convention on the Rights of the Child.